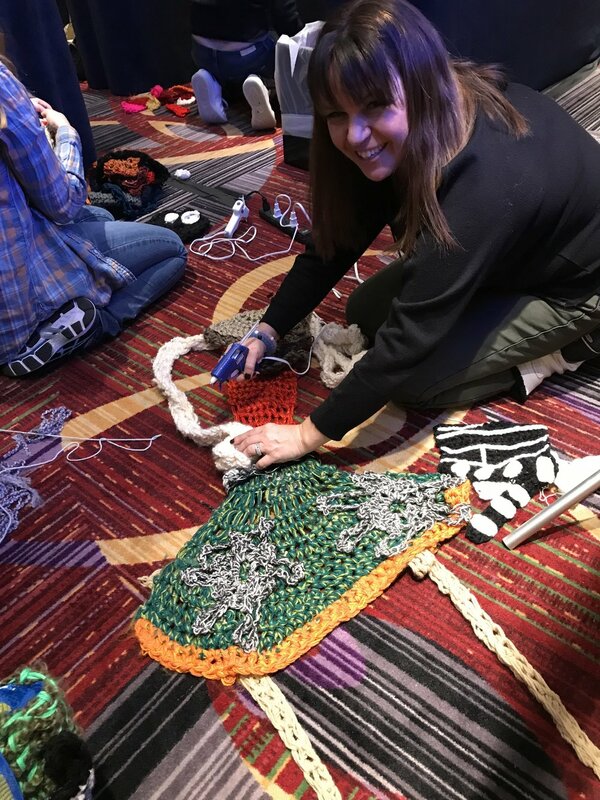 One of my favorite parts of Vogue Knitting Live NYC 2018 was that they had a London Kaye Yarn Bombing Workshop. I was excited because I knew this would be a highly interactive and extremely fun way to learn more about London but also some tips and techniques to achieve my own Yarn Bombing aspirations. The day started off with a bang. The elevator at the hotel broke and that gave me a 32 flight climb and descend. OYE! I was worried I would be late to class (and I was) but all in good fun and plus cardio for the day for the win right? The class and London were amazing. She gave us a brief overview of her background and it was super fun to learn so much more about her. I had no idea she was on Amazing Race. HOW DID I MISS THIS FACTOID???? She also talked about how her art, crochet, started and I loved her organic journey. I won't act as her biographer but I highly recommend you get to know her story if you get a chance. Then we got our hands dirty and by dirty I mean it was PLAY TIME!!!! We not only yarn bombed a chair together but London brought a lot of her scraps from previous yarn bombs for us to play with and create something new. It was magical. Working with London was super fun and inspiring. It really forced me to get out of my comfort zone and I think that was what I liked best about the workshop. As primarily a garment designer, math and dimensions and measurements are a huge part of what I do. Shapes and sizing and all the detail are essential. I love it. It drives me and makes me work to do better and improve. But that was a challenge when I want to yarn bomb because I am always too hung up on precise stitch work and detail to every millimeter. London's workshop really taught me how to throw caution to the wind and just make art. Not that my fashion and garment designs aren't art but this is different and really pushed my thinking and approach. It is more about the overall art. 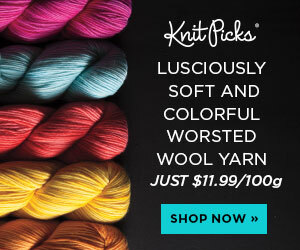 The joy of adding yarn and color and texture or a message. Truly the class turned out to be more than I hoped and I am so glad I signed up for it. 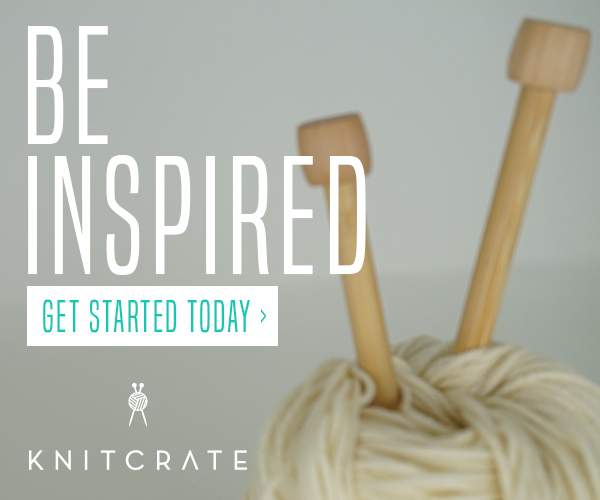 It pushed me to get out of my comfort zone of charts and schematics and graph paper and into the world of free form and who knows what will happen if I skip stitch (OH MY GOSH DID I JUST SAY THAT?!) and the beauty of not knowing what stitch may be next. To celebrate her new Kit Launch with Lion Brand Yarn, London is coming to host a Yarn Bomb Party at Stitch Up Chicago!!!! 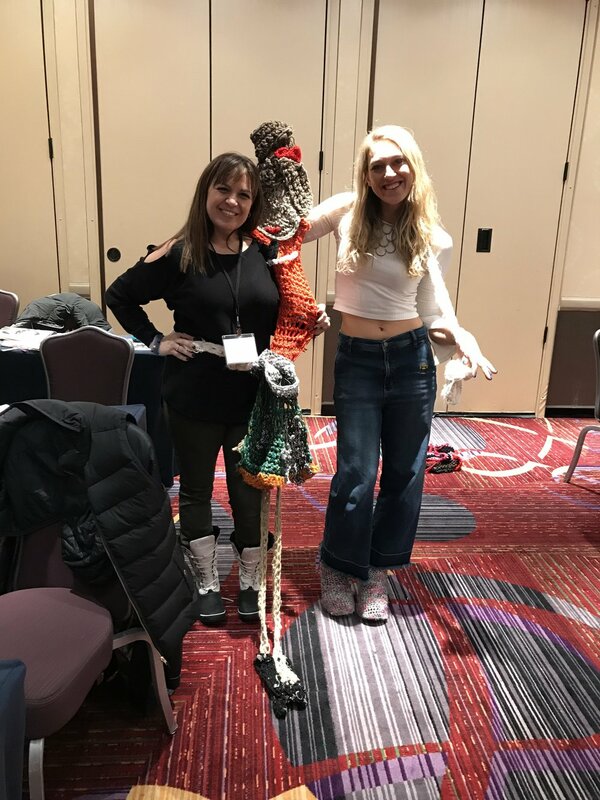 So yes - you too can come and get outside the box and learn some fun tricks to bring fiber art to the world and join us as we yarn bomb in Chicago. Register Here. And check out all of London Kaye's new Kits with Lion Brand here! !